This pretty salad is sure to win rave reviews! 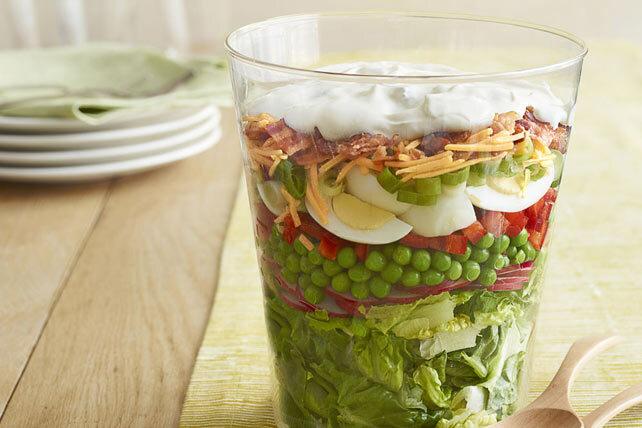 Place lettuce in large clear bowl; cover with layers of next 7 ingredients. Mix remaining ingredients until blended; spread over salad, completely covering top layer. Refrigerate several hours. Toss just before serving. Prepare using Miracle Whip Calorie-Wise Spread and light sour cream. Use tongs to easily toss the salad with the dressing. Salad can be refrigerated up to 24 hours before tossing and serving.